Fresh cream is a dairy product obtained by skimming the top layer of milk. It has a luscious texture and adds a touch of richness to the dish. It’s a wonderful ingredient that helps balance the mouth-feel and flavor of dishes, both Indian and international. Dress up a cupful of coffee or add it to Indian curries and makes them totally irresistible! 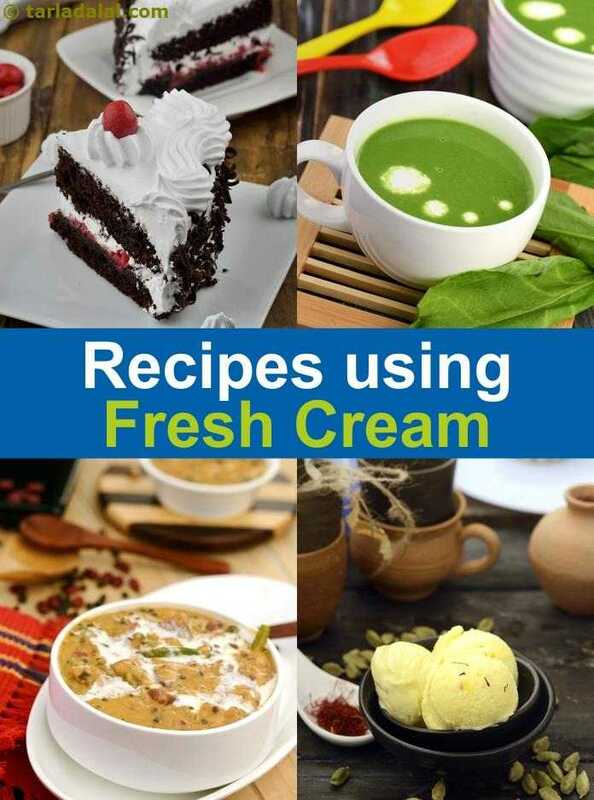 How to make Fresh Cream at Home? Alternatively, you can also make your own fresh cream at home. It is time-consuming but definitely worth the effort. After boiling milk each morning, let it simmer for a few minutes. Let it cool and then place it in the refrigerator for a couple of hours. After that, you will find a thick layer of malai on the top of your milk. Lift it carefully with a slotted spoon and store it in an airtight container in the freezer. Continue doing this for a few days till you have the required amount of malai. Then, leave the collected malai at room temperature for a while till it defrosts but is still cold, and then whip it using a hand blender till you get smooth, frothy cream. If you do not have a hand blender, you can also do this using the blender jar of your mixer grinder. Don’t whip for too long or you will end up with butter instead of cream! Just a whip or two will do. Whipped cream can be made using the fresh cream readily available in local dairies. Use it to lure your kids to the delicious cakes you bake! Yes, it is true that fresh cream has enhanced the taste of paneer makhanwala i made yesterday for dinner. will try for palakpaneer, chole and other thick gravy subzis ki recipe for sure. I am regularly gathering the layer of malai from our home milk for extracting ghee for my home. I will definitely go for making fresh cream also if it so easy to make at home.